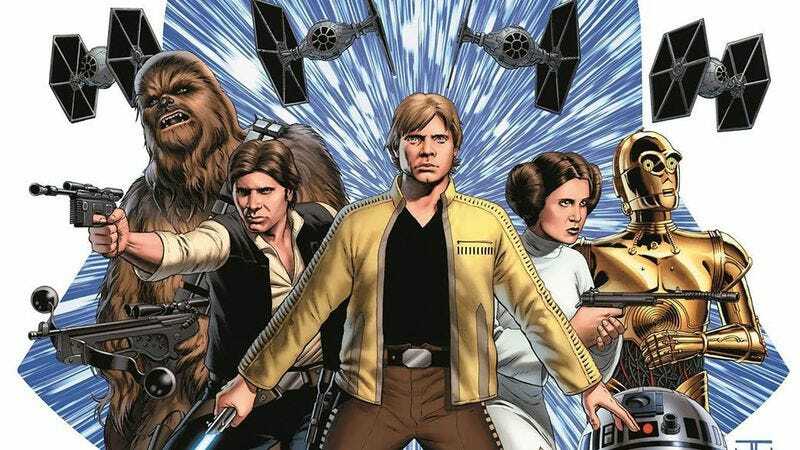 Marvel Entertainment has confirmed that it’s developing three new Star Wars comic-book series to be released in early 2015: Star Wars, the previously announced Star Wars: Princess Leia, and Star Wars: Darth Vader. The three titles will be the first new Star Wars comic books under the Marvel name since Disney bought Lucasfilm last year. (Star Wars is finishing its run with Dark Horse right now.) Much like the original Marvel Star Wars run in the late ’70s/early ’80s, all three will take place around the timeline of the original trilogy, specifically in the span between A New Hope and The Empire Strikes Back. The main Star Wars title begins “just a matter of weeks after the destruction of the Death Star,” according to writer Jason Aaron, as the Rebels are looking to capitalize on their blow against the Empire. Aaron’s partner on Star Wars will be John Cassaday, who drew the preview image above. Kieron Gillen and Salvador Larroca will work on Darth Vader, while Mark Waid and Terry Dodson will tackle Princess Leia. The Hollywood Reporter has more from the creators about their influences on the upcoming series and their longtime love of the franchise. Star Wars will hit stores in January, followed by Star Wars: Darth Vader in February and Star Wars: Princess Leia in March.